Perfect for audio professionals, students or anyone looking for advanced sound design at great value, this versatile tool makes a strong addition to any post-production project. The plugin’s simplicity and integration with TouchOSC makes it quickly adaptable to live environments as well, such as voiceover sessions, theatre performances or Halloween attractions. 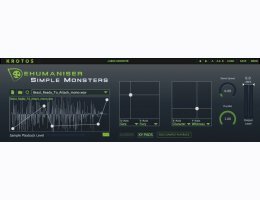 Dehumaniser Simple Monsters takes a new design approach to the familiar Dehumaniser technology, packing it into a simple but powerful user interface. Using only a collection of sliders and assignable X/Y pads, a huge variety of sounds can be coaxed from the plugin to create realistic monsters in a matter of seconds. 5 dynamic parameters and a sample scrubbing element allow you to quickly and easily design sounds for any character. Plugivery is an official distributor for all Krotos Audio's products.